How do I delete a channel in S5. When I right click on channel, the only option I get is "hide item". Where are you trying to delete it? You should be deleting it in the Preview Editor. I have deleted the props in the preview editor. They still show up in the sequencer window list. I can hide them, then how do I delete them? I can't remember exactly the procedure without bringing it up on a computer, but did you refresh the preview in Sequencer after changing the preview in the Preview Editor - sorry, I can't remember the actual term used. What k6ccc said! You can add and delete to your preview all day but If you don't refresh your preview in the sequence itself, it will keep using the old preview with that sequence. Whenever you change your preview, if you want that change to occour in every sequence already done, you have to refresh each sequence. I am not at home also so I cannot give you a step by step. 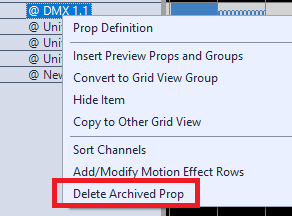 1) Right-click on the archived prop name in the grid and select "Delete Archived Prop"
2) Go to Sequence > Manage Archived Props, and from there select the archived props you want to delete. Good for deleting more than one at a time.